These tapas dishes are glazed in a mix of colour that accentuates the food presentation. Combination of calm satin shades is chosen to go in line with the atmosphere of the restaurant. Cuca is a casual dining destination that tempts you with three reasons to come: tapas, cocktails, and desserts, and three spaces to experience: an interactive and exciting food bar, a relaxed and intimate dining room, and a chilled out garden lounge. 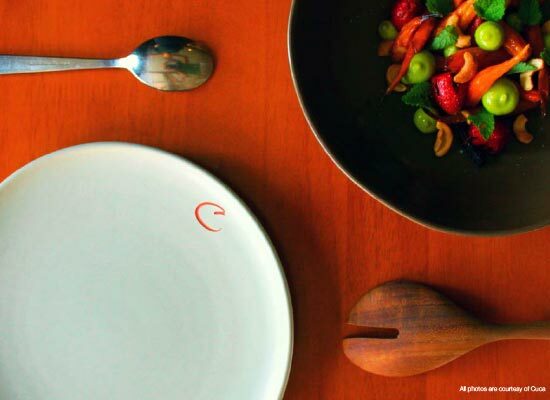 Cuca serves western cooking made only from the best and freshest local ingredients. It is truly a pleasure for Kevala to work together with the very talented and creative owners: Kevin Cherkas and Virginia Entizne.